Once the oil is hot, add the chopped ginger and chilly to it. Then add the onions and saute. Once the onion is sauteed then add the turmeric powder and salt. In a bowl whisk the eggs. Add the onion mixture to it. Heat the pan again with some oil. Pour in the egg mixture to it and stir it in the bottom. Then add the chopped tomatoes and chopped coriander to it. 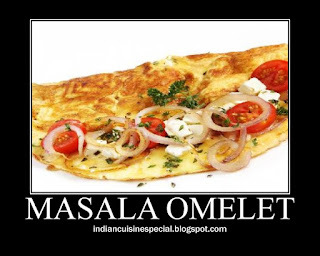 Flip the omelet and cook well. Once cooked you can serve the omelet with Tomato ketchup.